We are pleased to announce that the General Assembly of Syndesmos will take place 24-28 October 2019 in Broummana near Beirut, Lebanon. All member movements are invited to send their official delegates to contribute to this new milestone in the life of our Fellowship. This address is also to be used for all questions regarding the General Assembly (applying members, request for information or for updates, etc.) If your movement has not received the invitation via e-mail, please contact syndesmos@syndesmos.org to make sure we have the right contact information for your movement. Participants needing visas are encouraged to send their applications early. 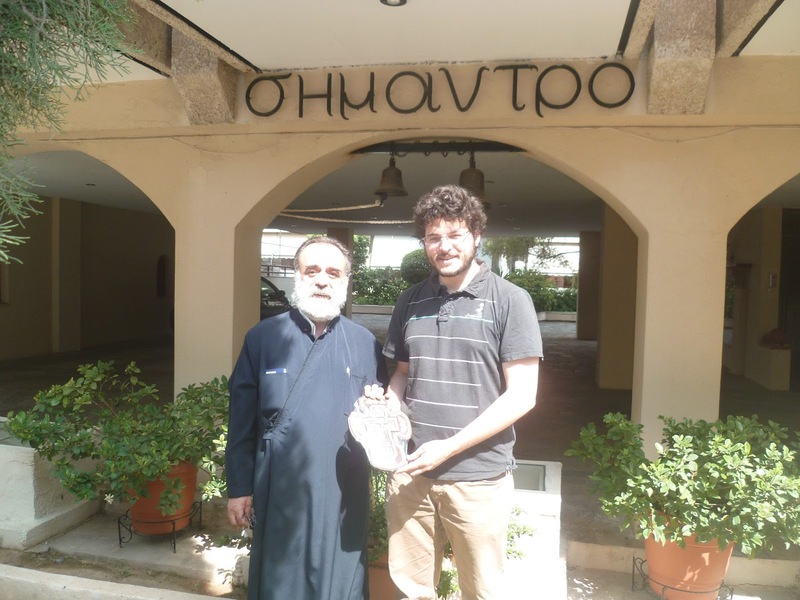 Syndesmos invites Orthodox Christians from its member organisations and beyond to spend a week of prayer, discussions and workshops on missionary and social ministries in the Church. The Syndesmos Summer Gathering 2017 will be held on the northern Aegean island of Samos in Greece – in modern Orthodox Metropolis Camp Facility located in Kotsikas, near the port city of Vathi/Vathy in Samos. You can fly into Athens International Airport (ATH) located in Athens, Greece. …OR you can fly directly into Samos Airport (SMI) in Samos, Greece from your country (if routes prove possible) OR from Athens International Airport (ATH). (NOTE: Check with low-cost Greek carriers such as AEGEAN AIRLINES...55-minute direct flights (ATH) to (SMI)). …OR you can take an all-day ferry boat OR overnight ferry boat from the Greek port city of Piraeus to the port city of VATHI/VATHY, Samos. Google HELLENIC SEAWAYS for ferry boat schedule. Please allow up to two days for travel by ferry boat to Samos depending on boat schedule. (NOTE: From Athens International Airport, one can take a cheap public train ride to the port city of Piraeus where ALL ships depart. Ferry boat trip can take anywhere from 8-13 hours as boat stops on several other islands along the way before reaching Samos. To give you an idea, the approximate cost of an economy ticket during the summer of 2016 for a one-way ticket: 49.50 EUROS). Please check with your specific country Embassy to learn specific requirements for travel to Greece (member of European Union) and to learn if a visa is needed. Regarding participants needing VISAS, in case of medical emergency to cover costs or other emergency needs, you will need to have proper health/travel insurance coverage. 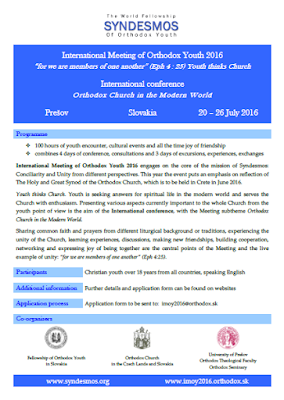 In July 2016, about 30 Orthodox young people from 12 countries (Belarus, Estonia, Ethiopia, Finland, France, Germany, Great Britain, Hungary, Russia, Slovakia, Ukraine, USA) and three continents gathered in Prešov to celebrate their common faith and share their thoughts, ideas and concerns. The Fellowship of Orthodox Youth in Slovakia was our host, in cooperation with the Orthodox Church in the Czech Lands and Slovakia, Orthodox Theological Faculty and Orthodox Seminary of University of Prešov. This year’s event took place in a particular context, only few weeks after the Great and Holy Council of the Orthodox Church in Crete. The participants were invited to reflect on the Church from the perspective of the youth. Inputs for reflection were given by father George Kovalenko from Kiev, who gave the series of lectures on the Council, on the secularization inside the Church and on his current projects, like the Open Orthodox University of Saint Sophia the Wisdom. Fr. Jan Safin, dean of the Faculty and fr. Milan Gerka, rector of the Seminary also shared their thoughts – fr. Jan by giving us historical introduction for the Church councils and fr. Milan by giving us insights to the history and present life of the Church in Slovakia throughout our stay in the Seminary. Interventions of fr. Nikolaj Lakata, fr. Ivo Petrovaj, fr. Boris Hrustic, fr. Vladimir Spisak and fr. Dusan Skurla were also enjoyed by the participants. The voice was also given to the Youth through workshops on the theme ‘What does the Church mean to me?’ and on designing practical projects to involve Youth more actively in Church life. Participants put forward classical theological concepts about the Church but also pointed out that openness of the Church is very important in the modern world, as well as the fact that the Church is a place of healing and compassion. They proved very creative on the practical workshops, by proposing ways to use internet sites or even apps, to involve young adults in sometimes playful ways, or by reflecting on how social and mission work can be combined with youth work. The days of the international meeting were penetrated with common prayer – in the mornings and evenings, before and after meals, and most importantly during the Divine liturgies in seminary church and in cathedral church celebrated by His Beatitude Rastislav, metropolitan of Czech Lands and Slovakia. An audience with the metropolitan was the occasion for warm exchange and will be remembered as one of the best moments of the meeting. Apart from conference and workshops, participants shared a lot of less formal moments, visiting the historical centers of towns Prešov, Košice, Bardejov and Bardejov Spa, Svidnik, Ladomirova. The cultural evening and Slovak evening were the occasion of building contacts and making new friendships. NEW : indicative program of the event! NEW: Indications on how to prepare your travel to Presov! 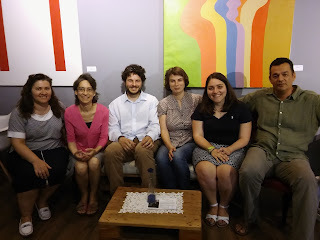 The visit was the occasion to meet with local member movements of Syndesmos and thus put into practice the recommendation of the last General Assembly of 2014 to reconnect with the members movements. Representatives of three Athenian movements (XFE, St. Gerasimos Youth Center and EPALXIS) were able to join and share about the rich life of these organisations. We could also share about the current situation and challenges faced by Syndesmos and invited the movements to encourage their youth to participate in the next International Youth Festival in Suprasl, Poland.